Premium appliance manufacturer Miele is leading the way when it comes to kitchen technology and has been for over a century. 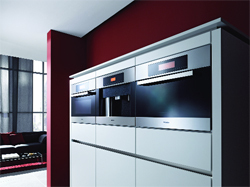 An innovator in design, Miele’s Generation 5000 is a sleek and modern collection of appliances. Ranging from 90cm ovens, single ovens, compact ovens, steam ovens and coffee machines, the appliances all complement each other in any formation.